Snowlion is a budget hotel located centrally on Gandhi road. The Mall is at less than 10 minutes walking distance. It's a relatively new hotel run by a Tibetan family - the Gaillys. There are three almost similar looking buildings that stand here next to each other with virtually no space in between. You may mistake them as one continuous building. Snow Lion is the one on the right having a small porch in front with a triangular roof structure. The building is brick finished and has no plasters. It looks quite nice from outside. As you enter through the main entrance, the small reception counter is right in front. You will likely be greeted by Sangeeta who is also one of the family members. 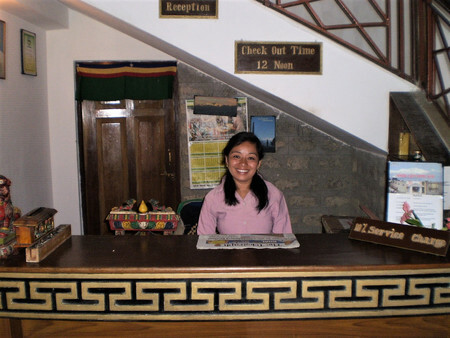 When I asked her once why this hotel uses homestay as part of its name, Sangeeta replied saying that the hotel is passionately run by their family who strives to provide homelike comfort to the guests. The service is personalized and friendly, and the owners family themselves live in the same building at the top floor. I had to agree that the service is not only courteous, but also warm and charming. There are symbols of two snow lions in the national flag of Tibet that symbolizes overcoming all obstacles in life. The first part of the hotel's name has been taken from this inspiration. There is a marbled stairway that leads to the rooms upstairs. There are 12 rooms in the hotel. The front facing rooms are Deluxe rooms while the back rooms are Standard rooms. The only difference being that the front rooms have large windows opening out to the road in front. Some of them at the top floor have nice views of the mountain range and the snow peaks. So if you are looking for rooms with good views, ask for a one on the top floor and facing the Gandhi road. 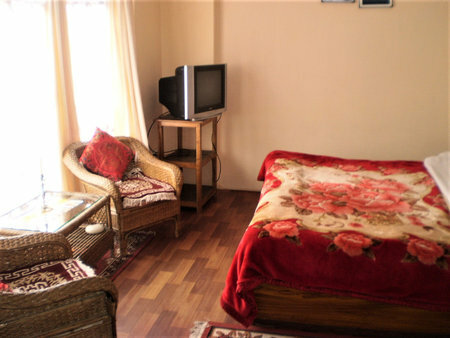 The rooms are of comfortable size and have all the standard amenities. There are large bay windows with curtains. There are cushioned wicker chairs and glass top tables kept near the windows to relax and enjoy the views (from the view rooms of course). In the back rooms you won't get any views at all and probably see a wall a foot away. Beds are of queen size with clean linens. The floors are partially carpeted. 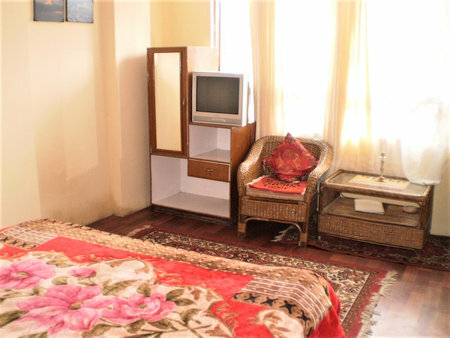 Rooms have a cupboard, a color TV with standard satellite channels, direct dialing phones etc. Room heaters are separately chargeable and provided on request during the winter time. They also provide hot water bottles or bags during the winter to keep your bed warm. Rooms have wi-fi internet access. There are few smoking rooms. Some rooms have in-room fridge as well. 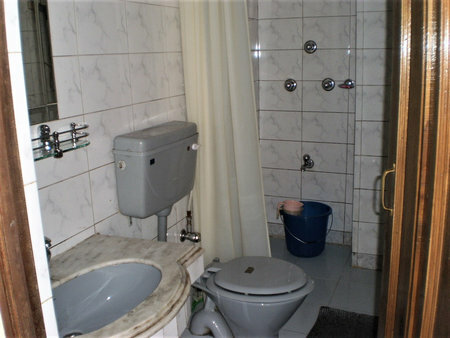 The western style bathrooms are of standard size and have geysers for hot water. The geyser and the room heaters work only when there is main power supply. There is a shower mixer as well in the bathrooms. SnowLion does not have any in-house restaurant. However they bring food from outside and have tie-up with restaurants nearby. So you will get all the meals served in the rooms against orders. However their rates include complementary bed tea and breakfast. And the breakfast is served in the family dining room. This is where you can meet up with some of the family members and chat. You get lovely views of the mountains from the dining room. You can also go up to the roof top terrace for the view of the snow peaks. You won't get mountain views from most rooms though. 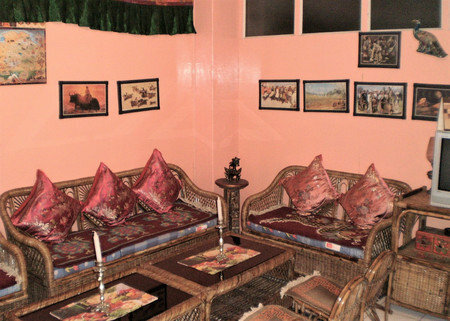 In the upper floors, there are nice sitting areas next to the corridors with wicker sofas and wall paintings. At the reception level, there is a nice lounge area with cushioned seating and TV which is done up in a typical Tibetan style. Update December 2015: They have recently renovated the rooms. All rooms now have Bhutan Pine wood paneling on the walls, Italian marbled floor, flat TV running cable channels etc. There is also 24-hours hot water in the bathrooms. Other services include travel & transportation, laundry, room service etc. Check In time: 12:30pm, Check Out time: 12 noon. They accept credit cards. Note to Readers: Snowlion is more like a budget hotel than a proper homestay. A homestay in Darjeeling is typically where you stay in a house or home of a local family, get to know local life and eat homemade food. If you are looking for such an experience, then there are more appropriate choices you can find here. Although the owner's family stays at the top floor and offers breakfast at the dining room, they actually run a hotel in the floors below. The guestrooms and the floors are laid out like a typical budget hotel. By calling itself a homestay, Snowlion may be misleading tourists. You should consider it as a budget hotel and NOT a homestay. By the way, the owner of the hotel also has a few cars on rentals, and very cunningly has given it a name as 'Darjeeling Taxis', the same way he has named a hotel as homestay. 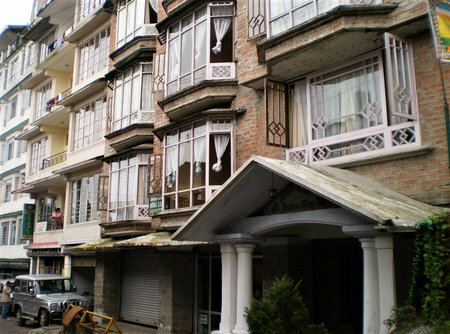 Snowlion Homestay is located on Gandhi Road and at a 10-minute walking distance from the Chowrasta Mall. The building is located right after the New Vaishali Hotel. There are many shops and restaurants within easy walking distance. 27A Gandhi Road, Darjeeling 734101, West Bengal, India.